Tomato fungus, also called blight, is the bane of tomato plant (Solanum lycopersicum) gardners everywhere. There is no cure for tomato fungus, but if you treat it early, you may stop its spread. A fungal infection can spread rapidly through tomato leaves and eventually to the fruit. The two main fungal diseases for tomatoes are early blight and late blight. Early blight (Alternaria solani) is a fungal spore that lives in the soil and strikes midseason. Late blight (Phytophthora infestans) is an airborne spore and hits mid- to late season. Early blight usually causes gray rings on the lower leaves, which eventually turn yellow and fall off. Late blight causes dark brown spots on leaves and on the fruit. Backyard tomatoes are a summer treat. Early fungus tomato blight can infect the plants when the weather is humid or there is a heavy rainfall. When watering your plants, avoid getting water on the tomato leaves. It's best to not use overhead sprinklers.Rather, hand water, directing the spray to the ground as fungal spores spread more easily on wet leaves. (see reference 5) Remove affected leaves with gray rings right away. Destroy the leaves by placing them in a plastic bag and deposit it in your trash. Never add infected plants to compost. (see reference 5) While picking off the leaves, be careful not to touch any other part of the plants. Late blight is especially contagious during periods of warm weather and high humidity. Spores from infected tomato plants can spread on a windy day from one yard to another. (see reference 1) If the plants have already set a heavy load of fruit, you will want to prune them for optimal health. When disposing of infected leaves, place them in a sealable plastic bag and put in the trash. (see reference 7). 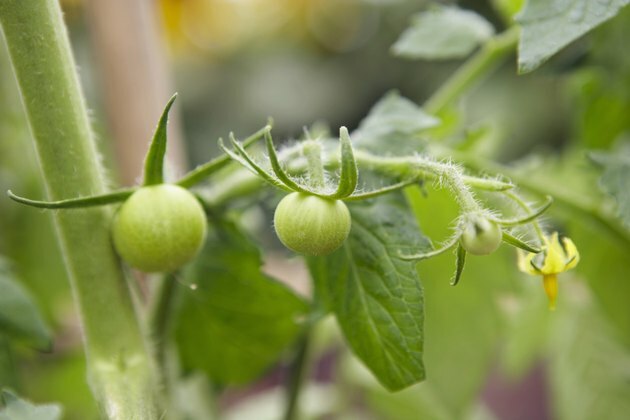 There are two types of tomato plants: determinate tomatoes, which stay shorter than about 5 feet, and indeterminate plants, which will continue to grow as long as they are watered and fertilized. When pruning determinate plants, prune all small green stems from the ground up to the first flower cluster. For indeterminate plants, prune all slim green stems from the ground level up to the second flower cluster. Always wash your hands thoroughly with soap and water after touching infected plants. (see reference 6, page 264). When pruning all plants, be sure to disinfect tools after each cut to be sure you are not spreading the disease to healthy leaves and especially from one plant to another. Use a spray of either 70 percent alcohol, chlorine or a household cleaner. (see reference 6). Fungicides, ( mancozeb with zinc 37.0 percent,) work to protect tomato plants against blight. Once a plant is infected, a fungicide won't cure the disease, but may help in stopping the spread to the rest of the plant. As a precaution, you can apply a fungicide before the plant becomes diseased. Once a plant is affected, the success of treatment depends on correct application. Fungicides can be purchased as a concentrate to mix in a hand-sprayer with water or ready-to-use. Among the fungicides to choose from is liquid copper fungicide. You can buy it ready-to-use or as a concentrate. If you buy the concentrate, dilute 2 to 3 teaspoons of fungicide concentrate in 1 gallon of water. Mix well. Pour the mixture into a hand-sprayer with a hollow-cone nozzle. The hollow-cone nozzle creates the required medium-fine 0.01-inch spray of droplets for treating tomato plant blight. Be sure the spray covers the entire canopy as well as the tops and bottoms of all leaves until the solution begins to drip off the foliage. Do not store left over solution. Mix fresh solution each time you spray which should be every 7 to 14 days to be sure new growth gets treated. (see resources 4, 5 & 6). One gallon of fungicide should cover approximately 20 square feet or 8 plants. When mixed with water, the copper sulfate releases ions that are toxic to fungi but relatively safe for the treated plants. (see reference 9). Although copper is safe to use with a long storage life, it can build up in the soil and become a contaminant. Copper sulfate is toxic to fish and water wildlife. Do not apply near lakes or other natural water environments. (see resource 7) Never apply on hot days, only when the weather is mild and not windy or raining. (see references 4 & 5) When spraying with any fungicide, be sure to wear long sleeves when spraying. It is wise to wear chemical-resistant shirts and pants, waterproof gloves, shoes, and socks, and protective eye wear. Tomatoes can be harvested up to the last day of fungicidal application. (see reference 10). There are home remedies you can try to treat tomato blight. Vinegar, as a fungicidal spray, can be used in the treatment for tomato fungus. (see reference 4 ). Mix 3 tablespoons of cider vinegar (5% acidity) with one gallon of water and spray in the morning on infested plants. Another home-made solution for use in helping the spread of tomato blight is baking soda (sodium bicarbonate) which has some fungicidal properties. The baking soda solution helps to dislodge the spores. Use as a prevention or as treatment at first signs of any of the diseases. Mix 1 tablespoon of baking soda, 2 1/2 tablespoons of vegetable oil with one gallon of water. Shake thoroughly. Add 1/2 teaspoon of pure Castile soap and pour into a hand pump spray bottle. Constantly shake the spray bottle while using it to spray plants. Be sure to spray both top and bottom of leaves. Repeat every 5-7 days as needed. (see reference 4). Tomato fungus gets into the soil, so rotation is an important step in managing re-infestation. Rotating plants requires moving one type of plant to another location and continue the rotating process every year for four years. For home gardeners with a small yard, it may be difficult. In a garden bed, moving the tomatoes a few rows to the left or right is not an effective rotation. (see reference 5). An option for gardeners with small yards may be to plant tomatoes in pots for a couple of years with fresh soil each year before re-planting in the ground. Since early blight fungus is soilborne, you are not likely to have a problem with it spreading to other pots if all of your plants are in their own containers. Late blight fungus is airborne, so the chances of other containers getting infected is high. Disinfect pots that contained infected plants before reusing. To disinfect pots, soak them using 1 part household bleach to 9 parts water for 10 minutes. Next scrub inside the pots with dish detergent and water using steel wool or a wire-bristle brush. Be sure to to remove any mineral deposits or left over debris from previous planting. Use a knife to scrape off any remaining mineral deposits. (see resource 3). Once clean and free from deposits or debris, rinse pots thoroughly and soak them in a bucket of clean water. Let the clay pots air dry thoroughly as a wet clay pot will wick moisture away and dehydrate newly potted plants. Diana Lea is a graduate of the University of Wisconsin with more than 20 years of technical writing experience. She is a certified Florida master gardener and writes extensively on gardening topics for various websites. Why Is My Mint Plant Growing With Black Spots on the Leaves? What Causes Strawberries to Mold?